Includes all the features BrightSign XT offers plus serial, dual USB and Live TV playback via the HDMI 2.0 input to play content from any broadcast channel – even protected HDCP content.All the features of the XD232 plus S/PDIF output for pure digital and surround sound audio, and additional interactive controls via serial and dual USB 2.0 ports. Offers a powerful 4K video engine capable of decoding two Full HD video simultaneously and an advanced HTML5 engine. It includes the standard I/O package of Gigabit Ethernet, GPIO, IR, analog/digital audio, and an M.2 SSD interface. 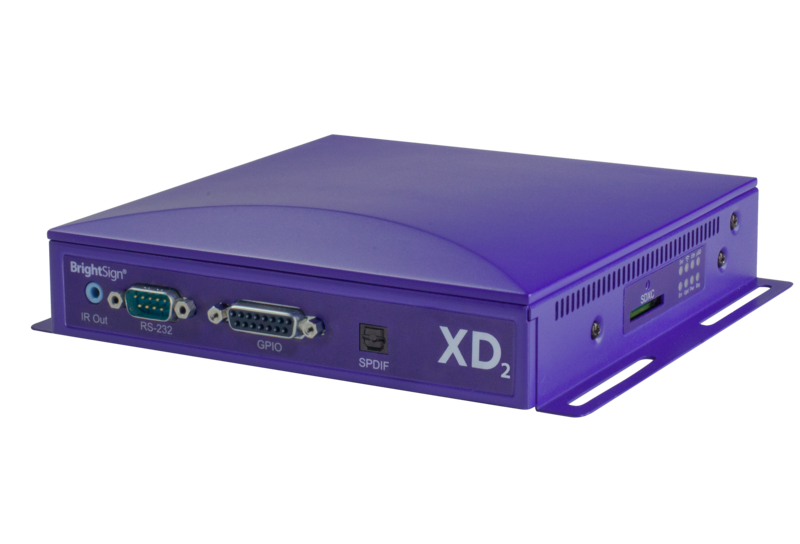 Includes all the features of BrightSign XD233 plus additional interactive options with the added serial and dual USB 2.0 (type A and C) ports for engaging interactive displays.